If you haven’t yet tried fat bombs, you’re missing out on a simple treat that has huge health benefits. It’s only fitting that I created a keto ice cream recipe (aka bulletproof ice cream) to take fat bomb treats to the next level! Find that recipe below. By the way, this post is sponsored by Perfect Supplements as they’ve recently launched a fantastic new product- Organic MCT Oil! 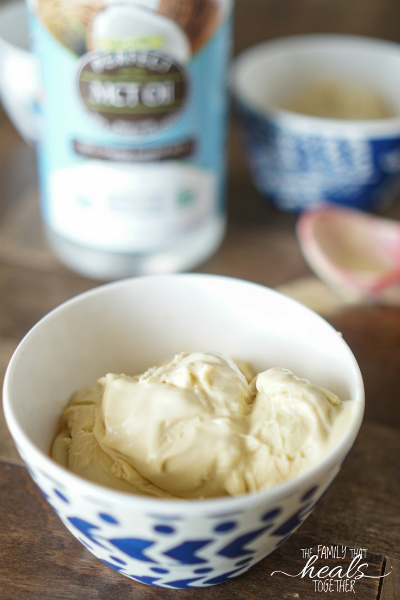 I’m so excited to share about why I love their MCT oil and how I use it in this keto ice cream recipe. To be honest, when I first heard about MCT oil, I was like “nuh uh.” I’m all about whole foods, and MCT oil is a component of coconut oil. Can’t you just eat whole food coconut oil and get the same benefits? The answer is no and I’ll tell you why. MCT stands for medium chain triglycerides or medium chain fatty acids. It’s a type of fat usually derived from coconut oil, but it’s also found in palm oil, butter, and grassfed beef. The reason separating these medium chain fats from the rest of the coconut oil makes for such a superior food is because it isolates the very best benefits of coconut oil. While coconut oil is a wonderful, inexpensive source of good fats, it’s largely made up of lauric acid (which is also a beneficial component, but simply doesn’t do for your body what true MCTs can do). It’s actually debatable whether lauric acid is a true MCT, because it doesn’t behave in the body the way the other MCTs do. The other MCTs (caproic acid, caprylic acid, and capric acid) are rapidly absorbed in your body, having essentially bypassed the digestive tract and gone straight to the bloodstream. If you’re not familiar with a keto diet, it’s a way of eating that is mostly fat, with moderate protein and very little carbohydrate intake. When you eat plenty of good fats and limit carbs, your body begins using fat as a fuel source instead of sugars, and for many people, this means better body and brain performance. 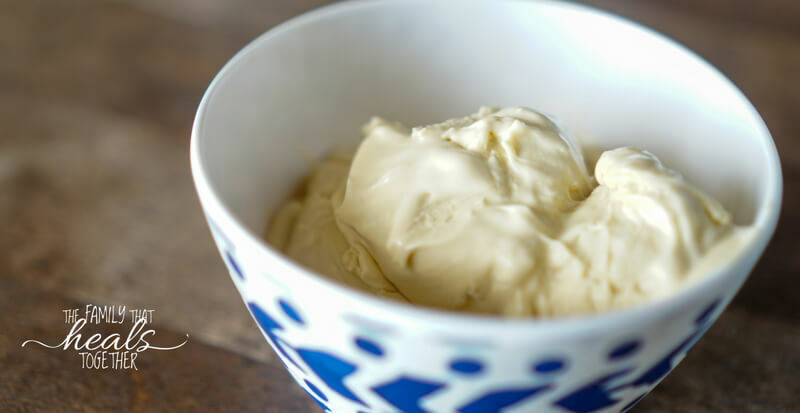 But you can still enjoy treats like this keto ice cream recipe! While many MCT oils on the market are made from lauric acid (which does not bypass the digestive tract or get converted quickly to ketones), Perfect MCT Oil is made only from c8 and c10 fatty acids (caprylic and capric). And while c6 (caproic acid) also converts to energy well, it can cause some stomach upset and may taste bad. That’s why Perfect Supplements was picky when it came to creating an MCT oil: they wanted to offer something superior to what was available (otherwise why bother?). And the truth is, they delivered! 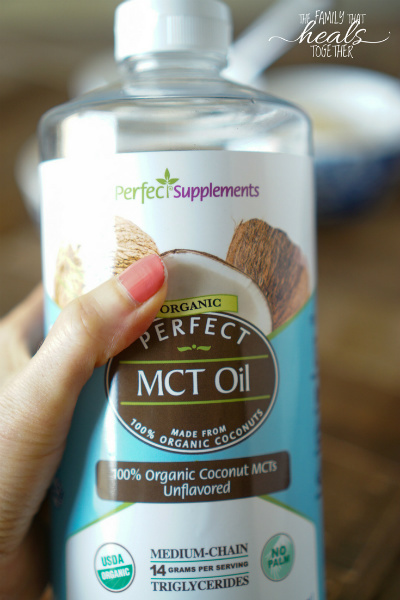 As with every product I’ve tried from Perfect Supplements, Perfect MCT Oil delivers. Their commitment to quality and affordability can’t be beat, as they source the highest-quality ingredients while keeping their prices low, making true nutrition available for everyone. And as if their prices aren’t already affordable, they offer multi-item discounts and free shipping for orders over $99. If you buy 3-5 Perfect Supplements brand products, you’ll save 25% on your order, and if you order 6 or more, you’ll save 30%! Trust me, that adds up to huge savings. PLUS- the kind folks at Perfect Supplements have extended an offer exclusive to my readers to get an extra 10% off any order using the code FAMILYHEALS10, which can be combined with the multi-item discount. Get Perfect MCT Oil here. Now that you’ve already got the MCT oil in your basket, you’re probably wondering what other items to throw in to earn the multi-item discount. My suggestion is Perfect Desiccated Liver Capsules, Perfect Acai Revive, and Perfect Rhodiola Rosea (read about how much I love Perfect Rhodiola here!). You can see all of their quality supplements here. On to the keto ice cream recipe! Blend all the ingredients together in a high-powered blender, making sure all the fat gets emulsified and is not clumpy. Freeze in an ice cream maker, following manufacturers instructions. Serve small portions, about 1/4 cup ea. This recipe should serve 4-6 people (it's enough for our family of six to each have a small treat). *My preferred source of sweetener is raw honey. I'm able to stay in ketosis and still enjoy small amounts of raw honey, and in this recipe, you should only get a few grams of carbs in a serving using raw honey. However, if you prefer a more keto-friendly sweetener like erythritol, you may use that as well. If your body is not used to high fat intake, you may consider taking digestive enzymes to help break down the fat in this ice cream. Are you a fan of the keto diet? 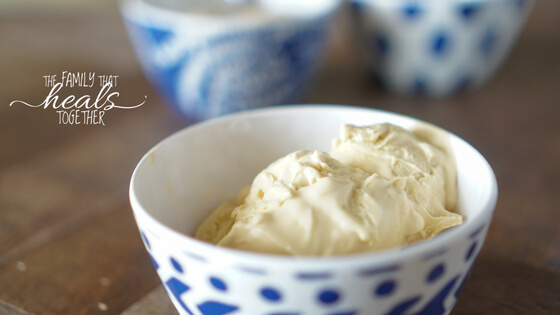 Be sure to share this keto ice cream recipe for keto friends who need a treat!